MOSCOW, RUSSIA (ANS – October 26, 2015) — My meeting with Russian dissident, Alexander Ogorodnikov in Moscow back in 1992, was one that I will never forget. In fact, it brought tears to my eyes, something that was quite unusual for a seasoned hack like myself. It took place during a period of my life when I was rather ashamed of my tawdry tabloid career in London’s Fleet Street with the Sunday People and the Sunday Mirror, and my time as a correspondent for the National Enquirer, and I had all but given up on my journalism. As ASSIST began to grow, I had decided to concentrate on running the ministry. After all, wasn’t that more spiritual than being a journalist? “Larry Ross wants me to fly to Moscow to join his media team and use my journalistic skills,” I said trying to take in what was being asked of me. After all, I had once worked as the Chief Reporter for Mr. Graham on The Christian, a London newspaper that he had bought, and then, after a year with the paper, it was closed and I lost my job, I never dreamed I would ever be able to work with him again. I also recalled how, sometime after I had moved to America, someone had told me that I really couldn’t write and I believed that. I had figured that my tabloid past had been a complete waste of time and could not be used by the Lord. Norma smiled and said pointedly, “It’s a good thing that Billy Graham doesn’t know that you can’t write….” I smiled weakly in response. Before I left, I had sent a message to Alexander Ogorodnikov, a Christian dissident who had spent many years in the Gulag for his faith – and for running a Christian discussion group at the Moscow State University, where he had found Christ after viewing a film about the life of Christ. After five years of this terrible existence, Alexander finally cracked and wrote a letter to Mikhail Gorbachev telling him that he was a Christian living in the Gulag and that, during his five years there, he had not received one visit or even a letter from a Christian. He said that he knew it was a sin to commit suicide, but he wanted to go home to be with Jesus and so he asked if he could be executed by a firing squad. I received an English translation of Alexander’s anguished message from Keston College in England, a center for the study of religion under communism. I cried when I first read his letter, feeling that we, in the West, had so let him down by not supporting him. Apparently, Margaret Thatcher, the then Prime Minister of Great Britain, had heard of his case and, during a visit to Moscow, “asked” Mr. Gorbachev, in a way that only the “Iron Lady” could do so, to free him. Amazingly, he agreed to her request and so I was anxious to meet him in Moscow, where he was now running a home for battered women and children. After checking into the President Hotel, a secret place that had been built for communist leaders visiting Moscow like Kim Il Sung, I went to bed to get a good night’s sleep. I rushed down the stairs and there was Alexander, dressed in a pin-striped suit, wearing glasses and with a pony tail hairstyle. He was nothing like I had imagined. “Dan,” he said extending his hand to me. “Thank you for caring!” I had to choke back the tears as he said this. I then took him into the restaurant for breakfast where we were joined by A. Larry Ross and some of the Billy Graham team members. There, after the coffee was poured, he turned to me and asked me to tell him more about how I had got so many Christians to write to him and so I explained about the TV appearance. “Did you ever see the letters?” I asked him. “I thought so,” he continued after taking a sip from his coffee cup. “Let me tell you what happened. After they would show me the sacks of mail, which I guessed were from America, they would take me to a punishment cell where they hoped I would die from the cold. I would just have flimsy clothes on and the cell was like a block of ice. I would begin to shiver and soon hypothermia would set in and I knew that I hadn’t got long to live. After an extended breakfast at the President Hotel in Moscow, we parted company, and I just wanted to cry with joy that this amazing man of faith had been delivered from the Gulag and had just wanted to say “Thank you” for what had happened, not only to me, but the thousands of Christians who had also cared for his condition. 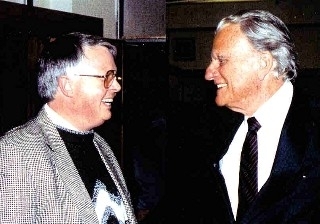 By the way, Billy Graham’s historic Moscow crusade, held in October 1992 in the indoor Olympic Stadium which, twelve years earlier, had been the site of the Moscow Olympic Games that the United States had boycotted, was quite incredible. What a crusade it was to report on! Each night eager Muscovites filled the 38,000-seat stadium to hear Billy. On the first evening inquirers coming forward signed 10,641 cards of commitment; on the second evening 12,628 signed. On the closing Sunday afternoon 50,000 persons had jammed into the stadium, and apparently the fire people didn’t limit them. Another 30,000 stood outside in the freezing cold where a huge television screen with audio echoed what was happening inside. The number of decision cards signed was 19,417. When I got home, I then knew that I had to start up my journalistic career and so I began the ASSIST News Service (www.assistnews.net) as a first step. I had finally realized that God can use even an ex-tabloid journalist to spread the word about what He is doing in His World. And it all began with a phone call, a miracle meeting in Moscow with a wonderful Russian Christian, and three incredible weeks in the Russian capital with an American evangelist. Note from Dan Wooding: When I launched ANS all those years ago, I took the decision that we would never charge for subscriptions, but instead trust the Lord to use our friends to help us continue. So, if you would like to help support the ASSIST News Service, please go to www.assistnews.net and click on the DONATE button to make you tax-deductible gift (in the US), which will help us continue to bring you these important stories. If you prefer instead to write a check, just make it out to ASSIST and mail it to PO Box 609, Lake Forest, CA 92609, USA. Photo captions: 1) Dan Wooding meeting with Alexander Ogorodnikov in Moscow. 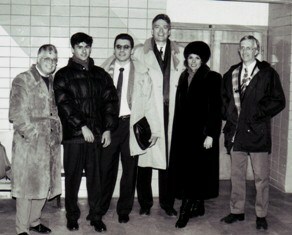 2) The Billy Graham media team in Moscow. Larry Ross is the tall fellow in the middle of the picture and by his side is his wife, Autumn. 3) A more recent picture of Alexander (http://www.frontpagemag.com ). 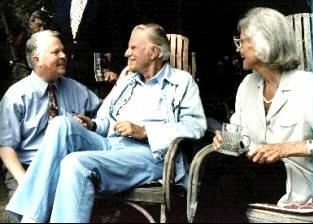 4) Dan meeting on a later occasion with Billy and Ruth Graham at their home in Montreat, North Carolina. 5) Part of the huge crowd in the Olympic Stadium, Moscow (BGEA). 6) The Red Amy Choir singing “The Battle Hymn of the Republic.” (BGEA). 7) Dan Wooding recording his radio show. About the writer: Dan Wooding, 74, is an award-winning journalist who was born in Nigeria of British missionary parents, now living in Southern California with his wife Norma, to whom he has been married for 52 years. They have two sons, Andrew and Peter, and six grandchildren who all live in the UK. He is the founder and international director of ASSIST (Aid to Special Saints in Strategic Times) and the ASSIST News Service (ANS) and he hosts the weekly “Front Page Radio” show on the KWVE Radio Network in Southern California and which is also carried throughout the United States and around the world, and also two TV shows, Inside Hollywood with Dan Wooding, and Windows on the World, which are both carried on the Holy Spirit Broadcasting Network. 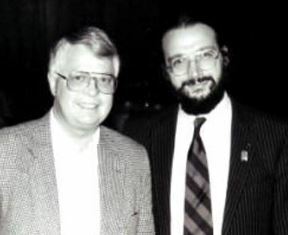 Dan began his journalistic career in 1968 working for Billy Graham’s British newspaper, The Christian, and has worked as a writer for Mr. Graham’s media team in Moscow, Russia; Essen, Germany, and San Juan, Puerto Rico.